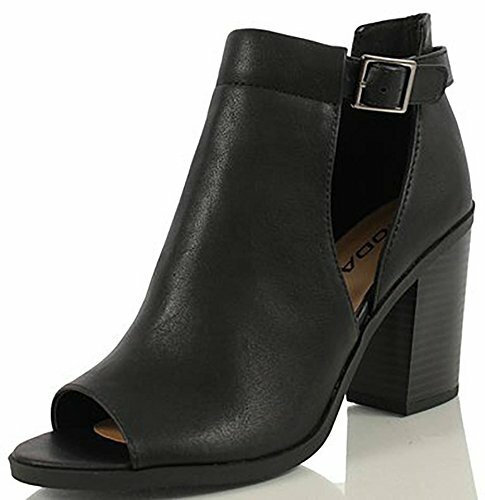 Quality Peep Open Toe Ankle Boot MVE Shoes - Cutout Ankle Strap Stacked high Heel Bootie by Soda.. ESSENTIAL SHOE FOR YOUR CLOSET: Gorgeous Peep toe booties are an everyday essential to complete your look. This revolutionary trend has become a wardrobe staple. EFFORTLESS COMFORT & SLIP RESISTANT: An ultra-soft, comfortable lining and a cushioned footbed for all day walking comfort. Featuring a non-slip outsole these booties will never fail to impress you with how charmingly they complete your look..